A grave may seem an unlikely setting for a celebration, but every Thursday night the derelict tomb of Baba Shah Jamal in Lahore, Pakistan, attracts those seeking spiritual ecstasy through dancing, drumming and-in some cases-hashish. 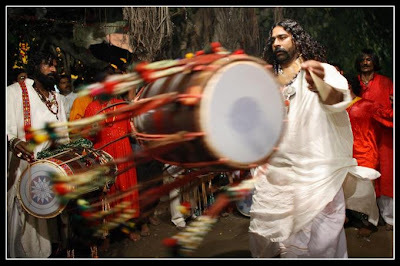 Shah Jamal, a 16th century Sufi saint, used drums and ecstatic dancing to spread his faith throughout Pakistan (he would have deemed the drugs unnecessary) and devotees have been upholding the tradition for more than 300 years. Today, the ministry is carried on by Pappu Sain and his two students, Gonga and Mithu Sain—resident holy men at Shah Jamal's tomb, which is also a shrine. Pappu Sain is a virtuoso of the dhol, the traditional Punjabi drum, and his performances are legendary. He has appeared in concert halls across South Asia and Europe, but his most rapturous drumming is often before his home crowd, which cares nothing for stadium acoustics. The open air, the close quarters (the dancing crowd forms one churning, swaying body) and the sinuous rhythms render the experience otherworldly. Performers and devotees enter trance like states and those who have room to move surge to their feet, hands upraised, to start spinning in tight circles. Old bearded men with metal canisters on their backs spray the crowd with cooling rose water, but usually there is no real respite until dawn. Not a Sufi? You will be one tonight. - by Aryn Baker. Read the article here.